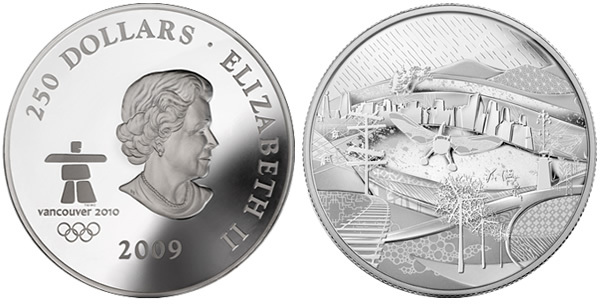 The Royal Canadian Mint has released the 2009 Modern Canada Fine Silver Kilo Coin as the third offering in a series that began in 2007 with the "Early Canada" design, and was followed in 2008 with the "Towards Confederation" coin. These coins have an extremely low worldwide mintage of just 2500, with each priced at $1,599.95 CAD. The "Modern Canada" image was created by the Vancouver Organizing Committee design team as a tribute to the contemporary Canada that will play host to the Vancouver 2010 Olympic and Paralympic Winter Games. The ultra-high relief process normally reserved for medals was used to create the extremely detailed images. The reverse of this coin attempts to illustrate the diverse attributes of the area that will play host to the Olympics. It features both nature and technology, with nature being represented with aspects of water like rain. Nature is also portrayed with trees and the landscape of the country. Technology is portrayed with images of train tracks, a bridge, a cityscape and power lines. 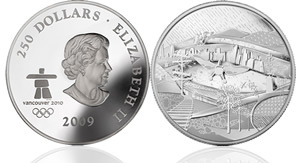 The obverse designed by Susanna Blunt contains a portrait of Queen Elizabeth II, the denomination of $250 Dollars, the year 2009, and the Vancouver 2010 Olympic symbol. This massive coin is a whopping 101.6 mm (4 in) in diameter, and contains one kilogram of 99.99% pure silver. The Mint also has a gold version of the coin with the same design and one kilo fine weight. Only 50 of these coins are available with each priced at $54,000. have sister coins available with the same design in gold that have an even more limited availability of only 50 units. My collection of one-kilo silver coins commemorating sport events is growing bigger and bigger. Apart from the three coins described in the article (Early Canada, Towards Confederation and Modern Canada), the RCM has issued also a one-kilo silver coin for the paralympic games (Surviving the flood). It’s too bad that they include the oversize 2010 vanoc olympic mark on these coins. I think they would look a lot better without it. Plus, it’s getting to be wayyyyyyyyyyyyyyyyyyyyyyyyyyyyyyyyyy overdone. Every darned coin the put out seems to have the stupid mark. I know, its not true, but it seems like it. It makes an otherwise really nice coin into just part of a tacky marketing campaign.